Q. How do I create a stable URL link to content in Lexis Advance? Lexis Advance has a separate login portal for students and staff therefore, a stable URL must be created for each category. 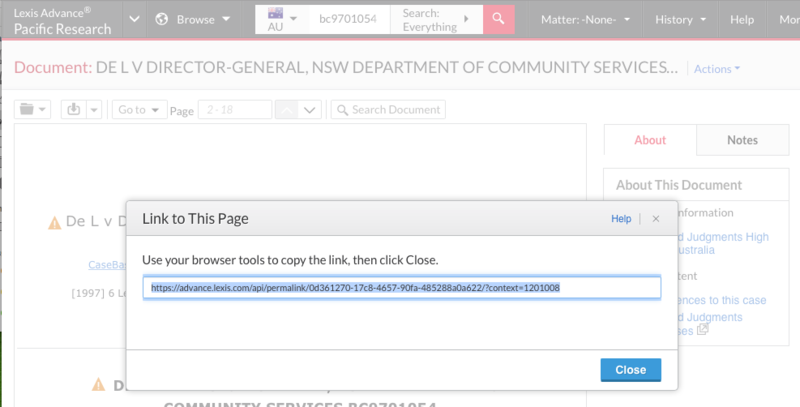 Go to the publication or document in Lexis Advance, click on the Actions tab, select Link to this page. Add one of the following Federation IDs to the end of the copied URL. To do this paste the copied URL into a plain text file (e.g. notepad, notes) then add the relevant Federation Id.